Owner of a truly unique historical and cultural legacy, Córdoba has given way over the centuries to a myriad of anecdotes and curiosities more or less widespread that have made it even more famous: Legends of the Mosque, poems of the Guadalquivir, Portraits and sculptures of the ancient Arab and Jewish sages have come in one way or another to our ears. 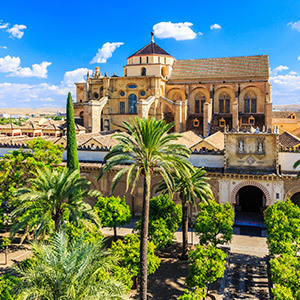 There are many Córdoba cities and villages in the whole world, the original is in Spain, but it has served as a model for place names in almost all the countries of Latin America, in addition to having lent its name to several localities of the United States. Apart from having the second largest historical center in Spain and Europe, Unesco chose Casco Viejo de Córdoba as a World Heritage Site in 1994, making it the largest urban area of the World Heritage. LolaFlora will cheer your days and the days of your loved ones, delivering flowers on time to every corner of Cordoba. Delivering the arrangement that you choose in the interval of time of your preference, with an atacched card with the message you compose, at the address you provide us. If you want to send flowers in Cordoba, you are in the right place!